Gujarat Police gave him the “choice” of being implicated in the Godhra train burning, Haren Pandya murder and Akshardham terror, one of the men acquitted by the Supreme Court in the temple attack case alleged on Tuesday. Mohammed Saleem was eventually sentenced to life under POTA for involvement in the Akshardham case. 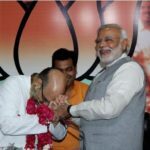 On May 16, the day Prime Minister designate Narendra Modi won his historic mandate, the Supreme Court set Saleem and five others free, pulling up the Gujarat Police for framing innocent people, and blaming the then home minister — Modi — for “non-application of mind”. Four of the six men had already spent over 10 years in jail. “I had been working in Saudi Arabia for 13 years, when they picked me up alleging there was a problem with my passport. They beat me brutally — I still have scars on my back, and I suffered a fracture in my foot. They asked me which case I wanted to be charged under — Akshardham, Haren Pandya or Godhra. I did not know what to say,” Saleem told a press conference addressed by five of the six men in Delhi. Saleem’s daughter was born four months after his arrest. He picked her up in his arms for the first time only after his release — the child is 10 years old now. The world of Abdul Qaiyum Muftisaab Mohammed Bhai alias Mufti Abdul Qaiyum has changed completely in the 11 years that he spent in jail. His father is dead, and his family no longer lives in their old home. His acquittal by the Supreme Court, Qaiyum said, was “mere release from prison; justice had been buried at every moment in these 11 years”. Qaiyum said the main charge against him was that two letters recovered from the two fidayeen killed in the terror attack had been written by him. He was framed, Qaiyum alleged. “For three days and nights, they made me copy a letter that they had given me. They (the police) would bring an expert each day to check whether I had copied it well. They would ask me to copy the turns and twists of the Urdu letters so that they looked exactly the same as in the letter. I was very afraid, and did what they told me to do,” he said. “Then they claimed in court that I had written the letters.” Qaiyum said that in jail, he met the police officers who had framed him, and asked them why they had done so. 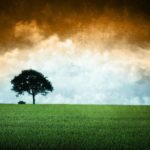 “I met G L Singhal. Though they (police officers) were kept separately, we sometimes bumped into each other. 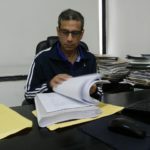 I told him (Singhal): ‘Please tell me why did you do this to me.’ His young son had committed suicide, and that had made him feel what grief was. 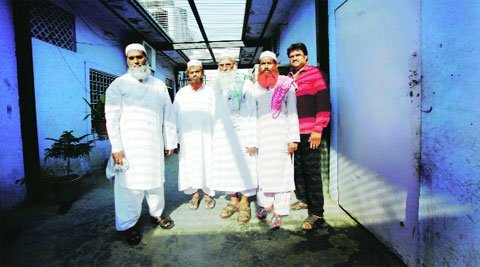 He had no answer.” Arshad Madani, president of the Jamiat Ulama-i-Hind which organised the press conference, said, “I am willing to talk things over with anybody to ensure such things do not happen, but I feahim (Singhal): ‘Please tell me why did you do this to me.’ His young son had committed suicide, and that had made him feel what grief was. He had no answer.” Arshad Madani, president of the Jamiat Ulama-i-Hind which organised the press conference, said, “I am willing to talk things over with anybody to ensure such things do not happen, but I fear that there is a real chance that this will actually happen more often.” He said the Jamiat would approach the Supreme Court to seek punishment for the officers who had framed the men. “Supreme Court and judiciary is our last hope. The government and the media have been biased, and an atmosphere has been created in which every Muslim is seen as a terrorist,” Madani said.r that there is a real chance that this will actually happen more often.” He said the Jamiat would approach the Supreme Court to seek punishment for the officers who had framed the men. “Supreme Court and judiciary is our last hope. The government and the media have been biased, and an atmosphere has been created in which every Muslim is seen as a terrorist,” Madani said. This article originally appears in the Indian Express. Reproducing it here because I don’t trust our government enough that articles like this may not go missing in the future.